Yoshitoshi (芳年, 1839-1892) is generally considered the last great master of the Japanese woodblock print (ukiyo-e) - and by some, one of the great innovative and creative geniuses of that artistic field. During his life, he produced a large number of prints, estimated by some authorities at over 10,000 in total; this included many series of prints, many of great merit, as well as numerous diptychs, triptychs, etc. This site attempts to provide an online catalogue raisonné of his entire output. His career spanned two eras - the last years of the old feudal Japan, and the first years of the new modern Japan. Like many Japanese, while interested in the new things from the rest of the world, over time he became increasingly concerned with the loss of many outstanding things from the traditional Japan, among them the classic woodblock print. 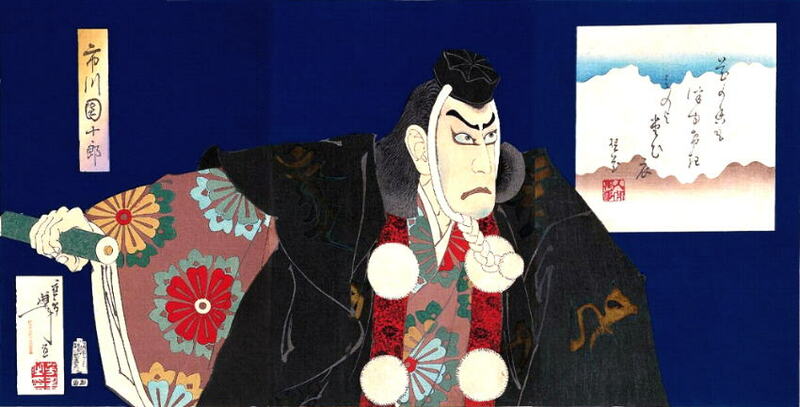 However, starting in the 1970's, interest in him resumed, and re-appraisal of his work has shown the quality, originality and genius of the best of it, and the degree to which he succeeded in keeping the best of the old Japanese woodblock print, while pushing the field forward by incorporating both new ideas from the West, as well as his own innovations. His reputation has only continued to grow, both in the West, and among younger Japanese, and he is now universally recognized as the greatest Japanese woodblock artist of his era. If you have a print (or an image of one) which we do not yet have, or a print (or an image of one) where we currently have a poor image (some of our images are small black-and-white illustrations gleaned from dealer catalogues, etc), we (and other Yoshitoshi admirers) would really appreciate it if you could provide us with a high-quality image for the site. The Obakemono Project - Ever wonder exactly what type of horrible Japanese ghoul is featured in your print?